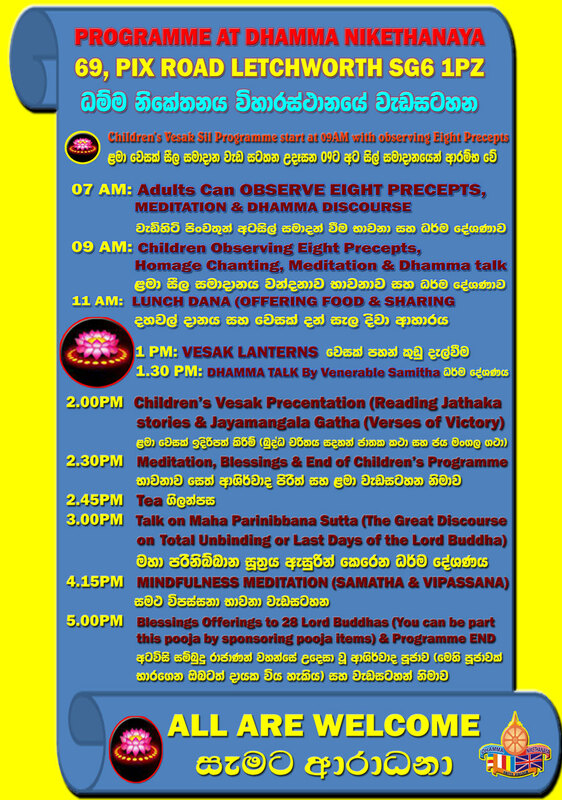 Special Programme to Celebrate Vesak Buddha Day on Full Moon Sunday 29th April 2018 from 7AM till 6PM with Sil (Observing High Precepts) Programme, Dhamma Talk on Noble Search (Ariyaparyeshana Sutta), Meditation, & Blessings Pooja on 73 Knowledges of Lord Buddha All are welcome to practice Dhamma on this Highest Blessed Day. Greetings for A Very Happy Vesak Sambuddha Day 2018..! We all at Letchworth Dhamma Nikethanaya Buddhist Cultural Centre wish you all our members and their respected loved ones and also to all across the globe, a Very Happy & Fulfilled Vesak Sambuddha Day Celebration 2018..! We will be thinking of you all during this Vesak Season (April 2018) at our life engagements in practice of Dana (Generous Sharings), Sila (Morality Practice), & Bhavana (Meditation) alone side Compassion and Wisdom, in true veneration to our Noble Teaching, the Flower of Human Kind, Lord Gauthama The Buddha. That is what our Lord Buddha appreciated as true followers. 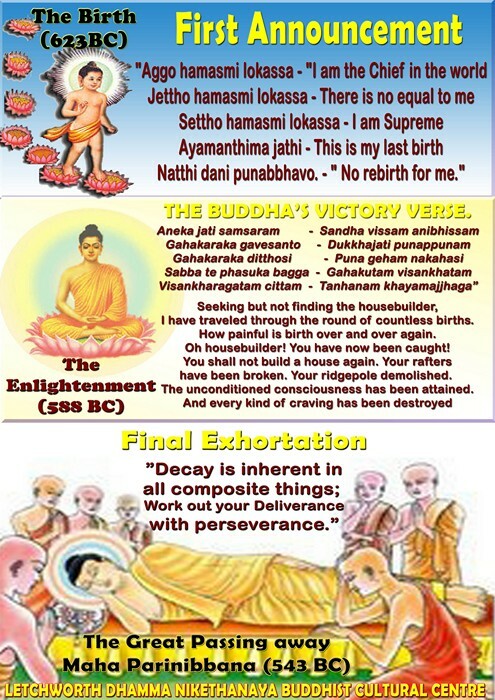 Let us endeavour to embrace the real Dhamma in this world, with full of uncertainties and suffering across the globe. We wish you all have the courage to do so. We take this opportunity to share our profound Gratitude to those who support us to deliver that compassionate message during the year passing of 2562 Buddhist ear (2018 Common Era), comfortably at this very difficult time. Also sincerely appreciate the continuous support which make us comfortable to continue our services, flourishing with Buddhist Education, way of life in Spirituality and particularly Mindfulness & Compassion Based Meditation at the centre, in the forthcoming Buddhist Year 2562 (2018 common year). On Sunday 29th April 2018, we will facilitate everyone to practice Dhamma with dana, sila and Bhavana from 9AM till 5PM. We look forward to seeing you on this day....! Finally we would like to encourage all our households to join us during this month (May 2018) by decorating their household shrines, houses, hosting a Buddhist Flag and visiting the Buddhist Centre with your beloved children to learn the Life of Buddha. May you all be well and happy! May this Vesak bring you peace, security, prosperity, moral accomplishment, liberation and lasting happiness! Greetings for a Blissful Vesak Buddha Day! 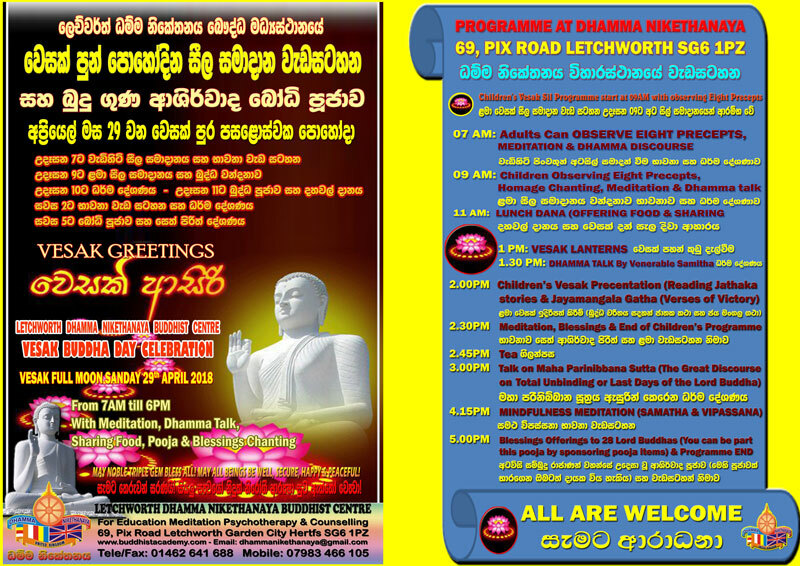 You all are co-ordially invited to join us to line up in Letchworth Dhamma Nikethanaya Buddhist Cultural Centre celebration of VESAK BUDDHA DAY on Full Moon Sunday 29th April 2018 by practice with utmost gratitude to our Lord Buddha. Letchowrth Dhamma Nikethanaya Buddhist Cultural Centre will host a special programme to enhance the benefits of the occasion. 7AM: Observe Eight precepts, Homage Chanting, Meditation & Dhamma Sermon. 4.00PM: SPECIAL DHAMMA TALK ON "Freedom from Suffering. Liberation is the highest bliss as taught by the Lord Buddha"
???? ???????? ????? ?????‍???? ????..! ??????? ?????..! May the Noble Triple Gem Bless you all! May all beings Be Well, Secure, Peaceful & Happy!